Reconnect,Relax and Reawaken your wild at a one of Mararkech’s leading retreats from August 20 – 26, 2016 at Peacock Pavilions. 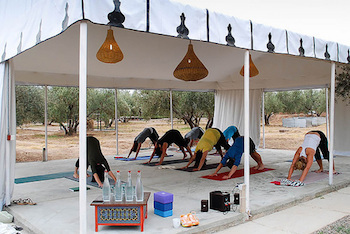 Co-lead by Holistic Creative Coach, Marie Milligan and Yoga Teacher, Deborah Willimott, the Wild Women Do Morocco Retreat offers a sensory-Moroccan experience that includes daily Yoga, Creative Coaching, Memorable Dining, Wild Exploration, and a true sense of Sisterhood. Peacock Pavilions – Located in the heart of a beautiful olive-grove, 20 minutes from Marrakech’s city center this boutique guest house boasts mountain-views, rose gardens, an outdoor pool, yoga pavilion, Arabian dining tent, ethnic art and textiles, and plenty of space for privacy or shared community. Designed by Maryam Montague, owner of Montague Living and Humanitarian, this Atlas Mountain retreat is the perfect place for discovery. Wild Women Do proposes the Ideal 7-Day Marrakech Retreat Experience. Their suggested Marrakech retreat menu brings the theme of Relax, Reconnect and Reawaken YOUR Wild alive. Always mindful of the weather and energy in the group, the Wild Women Do team bring flexibility into their menu whenever it is needed it most. Day 1 (Saturday 20 August): Two pickups and transfers from Menara Airport. Check-in at Peacock Pavilions (PP) at 4pm. Welcome canapés and non-alco cocktails. Dinner at PP. Time to relax, switch off and explore the grounds. Day 2 (Sunday 21 August): Introductory wellness ritual session (yoga, breathing and movement). Breakfast and lunch at PP. Creative Playshop. Free afternoon: optional relaxing Hammam spa experience or souk-shopping. Dinner at Le Jardin. Tour of the Medina, sensory-souks and hypnotic ancient and cultural Jemaa el-Fna food market and square. Day 3 (Monday 22 August): Yoga class. Breakfast and lunch at PP. Creative Playshop. Free afternoon: relax on the grounds or take an optional cultural design visit –perhaps visit Jardin Majorelle, ride a camel near Menara, or explore Designers in the French Quarter of Gueliz. Dinner at PP. Optional movie-night in their starlit Outdoor Cinema. Day 4 (Tuesday 23 August): Yoga class. Breakfast and lunch at PP. Creative Playshop. Free afternoon and evening: take time for you to relax by the pool and do nothing, or perhaps visit the iconic historical museums and palaces near the Medina. Optional dinner in Medina or at PP. Day 5</strong> (Wednesday 24 August): Yoga class. Breakfast at PP. 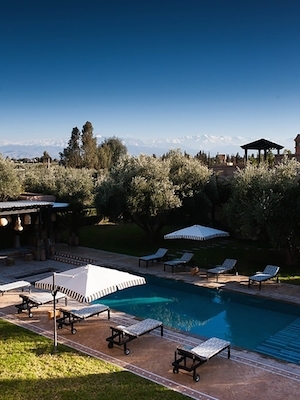 Travel to the Atlas Mountains with lunch in Kasbah du Toubkal, a National Geographic Unique Lodge. Guided wild trek visiting Targa Imoula, an ancient Berber village. Dinner at PP. Day 6 (Thursday 25 August): Yoga class. Breakfast and lunch at PP. Creative Playshop. Free afternoon: optional time for us to complete anything that needs supported from our inner or outer journey. Celebratory Henna-Party with local henna artisan, canapés and non-alcoholic fresh cocktails, followed by our celebratory dinner at PP. Day 7 (Friday 26 August): Breakfast at PP. Sisterhood accountability line. Farewells and checkout of Peacock Pavilions by 12pm. Group transfers to Airport (or why not extend your travel? See below for our exclusive travel deals). 10% of Peacock Pavilion’s profits from your retreat booking go to funding Project Soar. Set up by Maryam Montague, the project’s mission educates under-served girls and women in the local community with access to creativity, movement and art education to inspire their creative souls.